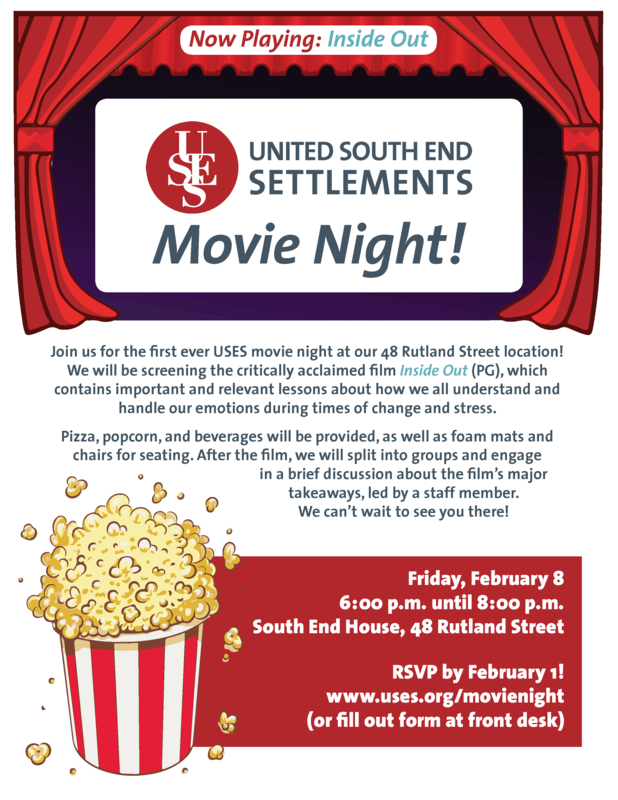 Home » After School » Join us for USES’s First Movie Night on February 8! Join us for USES’s First Movie Night on February 8! USES invites you to join us for the first ever USES movie night on February 8th from 6-8pm! This event is free and open to the public. After picking up your child, you can make your way down to the large-multipurpose room on the basement floor of 48 Rutland St, where we will be serving pizza, snacks, and beverages before the start of the movie. We are thrilled to be screening the film Inside Out (PG), which contains important lessons about how we all understand and handle our emotions during times of change and stress. Following the film, we will split up into groups for a brief discussion about the film’s major takeaways and their relevance to our own experiences. We will have foam mats and chairs available for seating, however we encourage you to bring blankets and/or pillows for added comfort! We will also have activities set up in the smaller multipurpose room if you need to step out with your child at any point during the film. To RSVP and secure a spot, fill out the Google Form using this link or sign up at the front desk by Friday, February 1st. If you have any questions or concerns about the event, please feel free to reach out to me at rburfeind@uses.org . We hope to see you there!